In November 1928, the NP Railway District Engineer was pushing for a new depot. Meanwhile, the Mandan NP lunchroom was under the direction of an energetic new manager, which was pulling in between $1,000 and $1,500 per month net profit for the railroad. He was doing it by attracting local patrons, despite a building that was "old, inadequate, and in need of repair." NP management included a new lunch room building in the budget for the 1929 reconstruction. One NP executive objected to building a separate lunch room on grounds that it would compete with local businesses in Mandan. But the separate lunchroom was approved anyway. 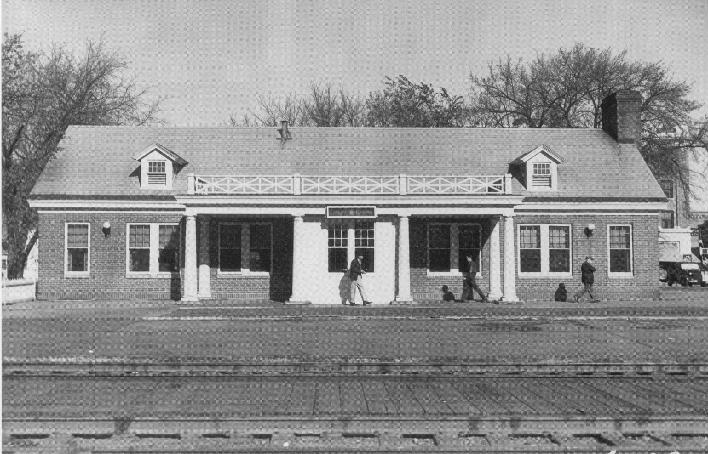 The original Mandan depot lunchroom was located east of the former Queen Anne - style depot. The new lunchroom was located to the west so that the prior lunchroom could be converted into an express baggage handling area to serve the surge in cargo destined for the newly opened north and south branch lines. However the demand for freight services was so great, that a new brick freight house was constructed west of the beanery along Main St. 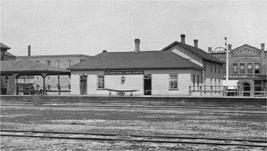 The construction of a new depot and lunchroom also included the construction of a 1,000 ton refrigerator type ice house for passenger train service located east of the eastside park and service building, SE of the Main St and 2nd Ave NW intersection. The "Beanery" building was modified several times. In 1930 a water softening plant was installed in the basement to provide softened water to the depot, the lunch room and passenger cars stopped at the deport. This facility was removed in 1942 when a connection was made to city water. Air conditioning was installed in 1936, partly because a coffee shop across the street also got air conditioning the same year. In 1943, a vestibule was built outside the front door. The large numbers of wartime travelers created congestion at the front entrance, which was near the magazine stand and cashier, and caused excessive loss of heat as passengers tried to entered and leave the building. In 1947, because of the practice of locking restrooms in the depot between trains, more people were using those in the basement of the building. Consequently, new restrooms were constructed to the east side of the lunchroom. In 1959, when the NP power plant was retired, a gas-fired boiler was installed in the basement of the lunchroom to heat the lunch room, the depot, the freight house and other nearby buildings. The Beanery and Depot buildings were bought by the City of Mandan in 1988 after standing vacant for 10 years after passenger service in the south central and southwest portion of the state was suspended by Amtrak. In 2008, space in the Beanery was leased to several community organizations including the Mandan Historical Society for a museum, the Mandan Art Association for a gallery and Mandan Progress Association for their adminstrative offices. In 2011, the Historical Society's lease was terminated to make room for additional gallery space. In 2013, the Art Association downsized to open the way for a confectionary and pastery business and would close its operations in 2014. In 2017, the latest chapter began with the move of the Five Nations Art store, operated by the Fort Lincoln Foundation, from the main depot to the smaller beanery building. This information was obtained in large part from the Northern Pacific Railway Historical Association and their publication "The Mainstreeter" Volume 16 No. 3 Summer 1997 issue written by Lorenz P. Schrenk. Additional information on the construction is taken from the 24 January 1931 edition of "Railway Age" article entitled Colonial Design Embodied in New NP Station by Lowry Smith; NP Office Engineer St Paul, MN.